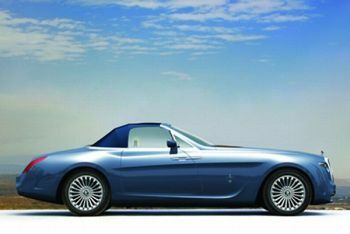 With just days to go until it is unveiled at Pebble Beach images and details of the coachbuilt Pininfarina Hyperion have emerged. With just days to go until it is unveiled at Pebble Beach images and details of the coachbuilt Pininfarina Hyperion have emerged. 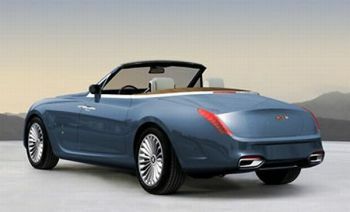 With the Hyperion concept, based on the Rolls-Royce Drophead Coupe, Pininfarina once again demonstrates its creativity and ability to interpret the different requests of the automotive industry. The great motorcars of the past served as inspiration for this project, and the dimensions, proportions and elegant lines of the Hyperion create an atmosphere of timelessness. All of the mechanical and technical components of the Rolls-Royce Drophead Coupe remain unmodified, but the driving position and the windscreen have been moved backward 400 mm, transforming the car into a wild two-seater. Elegant lines flow down the body's exterior flanks, narrowing to the rear, thereby creating a strong visual connection with the elegant shapes of famous speedboats. In addition to the standard rear boot, a new storage area has been created in front of the windscreen where the owner can keep specially built sporting guns. Another remarkable option on the car is its internal watch, specially designed by Girard-Perregaux and based on the Tourbillon Vintage 1945. This watch can be removed from its bracelet and clipped in the centre of the dashboard a unique feature designed and engineered exclusively for the Pininfarina Special Project Division.